As discussed in my previous post, the accidental discovery of the cosmic microwave background (CMB) in 1964 by Arno Penzias and Robert Wilson would prove to be one of the greatest scientific discoveries of the early twentieth century. One of the first things it achieved was to provide confirmation of the big bang theory. Although the big bang theory is generally accepted today, in the mid 1960s many astronomers still believed in the rival steady state theory according to which the Universe is infinitely old and will exist for an infinite time in the future and, taken as a whole, doesn’t evolve or change over time. This is described in more detail in my post the steady state theory. However, in the 1960s evidence was beginning to mount against the steady state theory, as observations of distant objects were beginning to show that the Universe had been changing over time. In 1963 a new class of astronomical objects called quasars were discovered. These are incredibly bright objects which can be up to 1,000 times the brightness of the Milky Way, but are very small when compared to size of a galaxy. Quasars are only found at great distances from us, meaning that the light from them was emitted billions of light years ago. 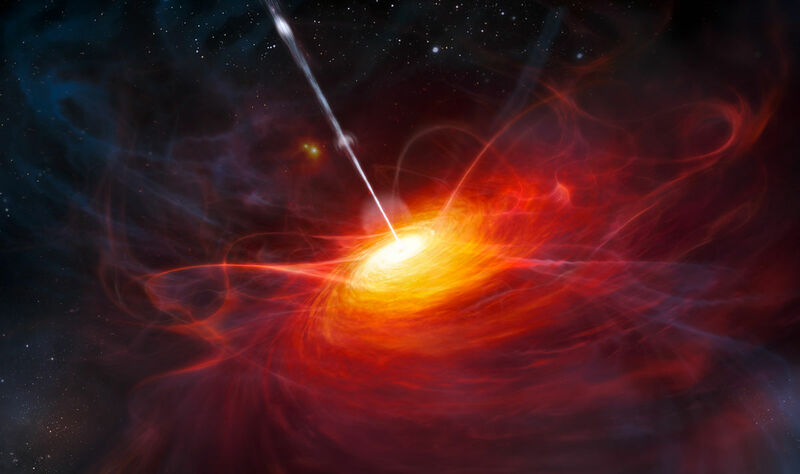 The fact that quasars are only found in the early Universe provided more evidence that the Universe has changed over time, further calling into question the steady state theory. The existence of the cosmic microwave background proved to be the final nail in its coffin. Although Fred Hoyle, one of the originators of the steady state theory, did come up with a convoluted theory to account for the CMB, virtually no other astronomers were convinced by his explanation. The big bang theory, on the other hand, predicted the existence of the CMB, and therefore its discovery provided further confirmation of its validity. It is almost impossible to explain by the steady state theory, whereas the big bang theory predicted its existence. By a strange coincidence, at the same time as Penzias and Wilson were making their discovery, the astronomers Robert Dicke (1916-1997) and Jim Peebles (1935-) had performed some detailed calculations on the conditions in the early Universe. These calculations also predicted the existence of the CMB and were about to start a search for it using a sensitive radio-telescope (see note 1). Before they could start their search, they were made aware that Penzias and Wilson had detected a weak microwave signal which was the same strength in all directions. This turned out to be exactly what they were about to start looking for. According to some accounts, Dicke said to his colleagues on hearing of the discovery, “well boys we’ve been scooped” (Levine 2009). Penzias and Wilson had not predicted the CMB and, when they published their results, did not explain their accidental discovery. Nevertheless, it was they who were awarded the Nobel prize, rather than Dicke and Peebles, who had done the calculations which actually explained Penzias’ and Wilson’s observations. One fascinating thing that measurements of the microwave background allow us to determine is the speed and direction in which our immediate cosmic neighbourhood is moving with respect to the rest of the Universe. As readers of a previous post may recall, the Sun is one of around 400 billion stars in the Milky Way galaxy, and the Milky Way is one of over 200 billion galaxies in the observable Universe (Cain 2013). Our galaxy, together with the large spiral galaxy in the constellation Andromeda and around 50 smaller galaxies form a collection of galaxies bound together by gravity, called the Local Group. Precise observations show that when we look at the CMB in more detail, it is not exactly the same in all directions but rather has some fluctuations in its strength. One cause of these is the fact that as the Earth moves around the Sun at a speed around 110,000 km/h. 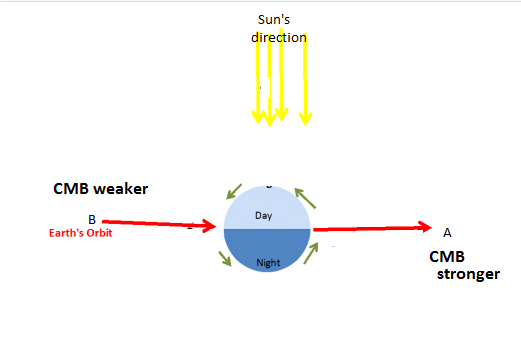 This causes the CMB to be fractionally stronger if we observe it in the direction in which the Earth is moving around the Sun, and fractionally weaker if we look in the opposite direction, due to an effect known as a Doppler shift. This is shown in the diagram below. If we subtract the fluctuations in the microwave background due to the Earth’s motion around the Sun, then there is still a variation in the microwave background caused by the Sun’s motion around the centre of our Milky Way galaxy. The Sun orbits the centre of the galaxy at a speed of nearly 800,000 km/h, taking about 250 million years to do a complete orbit. In addition, all the galaxies in the Local Group are moving with respect to each other (see note 2). If we subtract the unevenness in the CMB due to the motion of the Sun around the galactic centre, and also our Milky Way’s motion within the Local Group, we are still left with an unevenness in the microwave background. It appears strongest towards a point which lies in the constellation Hydra and weaker at the opposite point in the sky. This because the Local Group is moving at 2 million km/h towards this point (Scott and Smoot 2015) (see note 3). 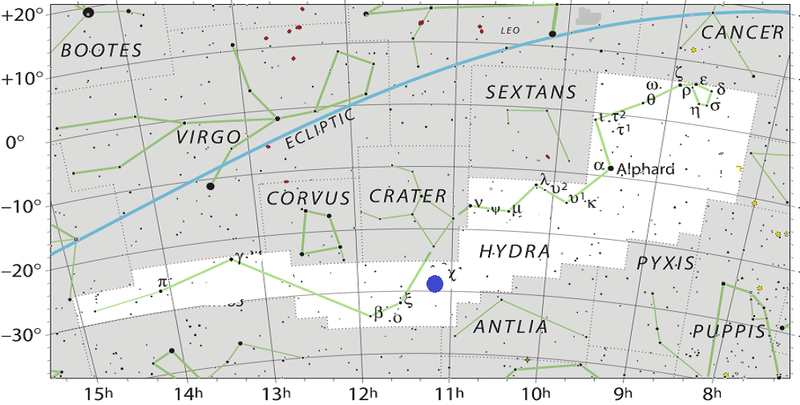 The digram above is part of a sky chart showing the constellation Hydra. 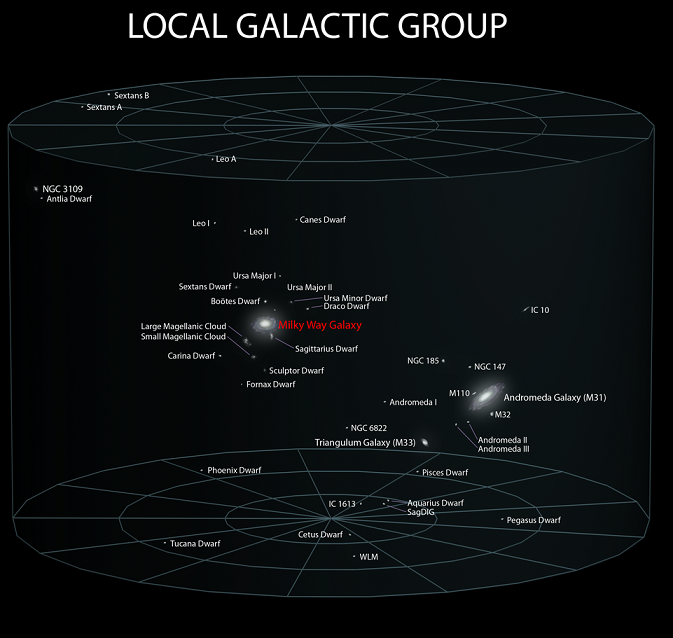 The blue dot marks the point towards which our Local Group of galaxies is moving. The radiation we observe today as the CMB was emitted when the Universe was around 400,000 years old. Before this time the Universe consisted of a plasma through which radiation cannot pass, so this marks a limit as to how far back in time we can see, as no radiation emitted before this time can ever reach us. What we are seeing when we look at the CMB is the oldest light in the Universe. It is an imprint of how the Universe looked like when it was 400,000 years old. In the 1970s and 1980s calculations on the early Universe predicted that there should be a slight unevenness in the way matter was distributed. Over billions of years matter condensed around these clumps of slightly higher density to form the structures we observe today. It was also predicted that this initial unevenness should leave an imprint we could observe today. The background radiation should be slightly stronger in the regions where the density of matter was fractionally greater than the average value, and fractionally weaker where it was lower. These tiny fluctuations proved very elusive to find and were only discovered in 1992 by the Cosmic Background Explorer (COBE) satellite which was launched to study the microwave background (see note 4). Interestingly, the cosmic microwave background was first predicted by George Gamow, Ralph Alpher and Robert Herman in 1948. However this prediction was ignored by most of the astronomical community and there was no effort made before Penzias and Wilson’s discovery to look for it. Dicke and Peebles claimed to be unaware of this early prediction when they did their calculations. 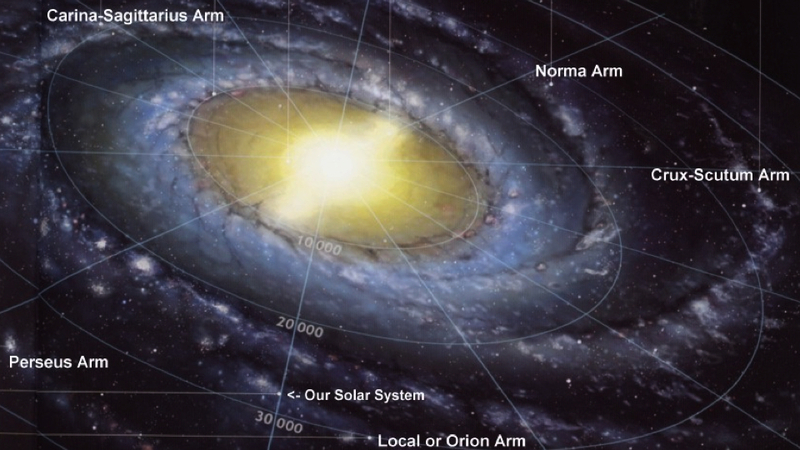 In fact our the Milky Way and Andromeda are on a collision course and will collide in about 4 billion years’ time. The is described in more detail in my previous post: The Ultimate Fate of the Universe. According to Scott and Smoot (2015) the coordinates of the point in space towards which the Local Group is moving is in galactic coordinates (l, b) = (276◦ ± 3 ◦ , 30◦ ± 3 ◦ ). This is equivalent to Right Ascension= 11h 6m 37.6s Declination= -27° 20′ 1″ in the coordinate system used in most star maps. There are causes of unevenness other than the motion of the Earth, Sun and Milky Way and the initial unevenness confirmed by COBE. One of them is due to an effect called the Sunyaev–Zel’dovich effect, which the light waves or photons from the CMB receive an energy boost when passing through clouds of hot gas. This is also known as the inverse Compton effect. Cain, F (2013) How Many Stars are There in the Universe?, Available at:http://www.universetoday.com/102630/how-many-stars-are-there-in-the-universe/(Accessed: 4 September 2016). 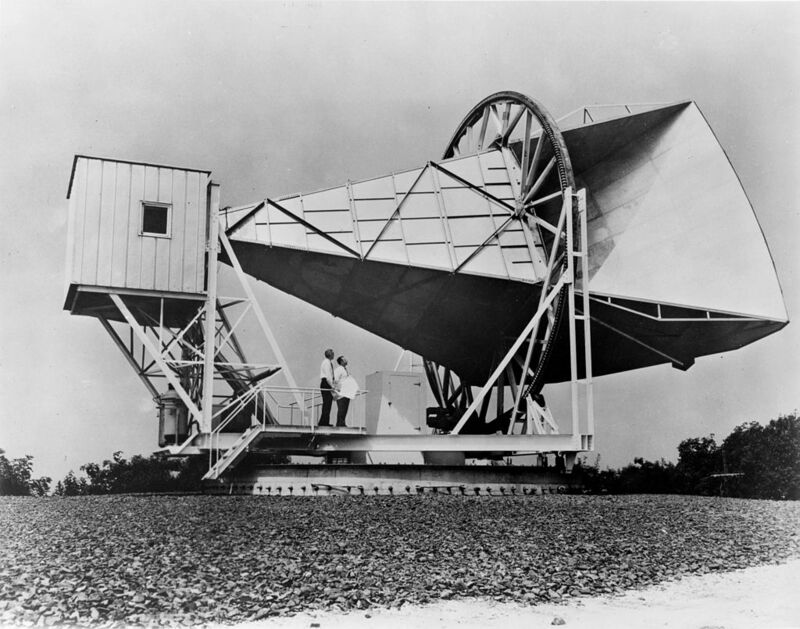 Levine, A. G. (2009) The Large Horn Antenna and the Discovery of Cosmic Microwave Background Radiation, Available at:https://www.aps.org/programs/outreach/history/historicsites/penziaswilson.cfm (Accessed: 21 August 2016). Nobelprize.org (2006) Nobel prize in physics 2006, Available at:http://www.nobelprize.org/nobel_prizes/physics/laureates/2006/ (Accessed: 11 September 2016). Scott, D. and Smoot G. F. (2015) Cosmic microwave background, Available at:http://pdg.lbl.gov/2015/reviews/rpp2015-rev-cosmic-microwave-background.pdf(Accessed: 28 August 2016). Love the blog! I write science fiction (although not hard) and I find your blog informative and accessible. Great stuff. Truly. Rather tough on Dicke and Peebles I always think, but that’s the way science works I guess. Yes, it seems like Dicke and Peebles really deserved the prize. Excellent description of CMB. Very informative and well written. Awesome! 🙂 I just found ytour article by scrolling through my home page, and it’s so cool! I am writing about cosmic background radiation too at the same time!! So interesting. I wonder why or what happened that we can’t see beyond a certain point in the past. Is it a veil? The reason why we can’t see further back in time than the recombination time is that before that time the Universe was opaque to radiation. Radiation cannot passed thorough a plasma. So no radiation emitted before that time can ever reach us. You can tell I’m not a science-y person but I am very interested in science. I appreciate your patience with me. Wonderful post. I’m a little confused by your fourth note. Is the CMB moving? The answer to your question is as follows…. According to Einstein’s theory of relativity there is no ‘absolute’ space against which motion can be measured. So the question ‘Is the CMB moving?’ doesn’t really make sense unless we specify with respect to what the CMB is moving. However, he Cosmic Microwave Background provides a ‘natural’ frame of reference against which motion can be measured and, as I talked about in the post, our Local Group of galaxies is moving with respect to this natural frame of reference.